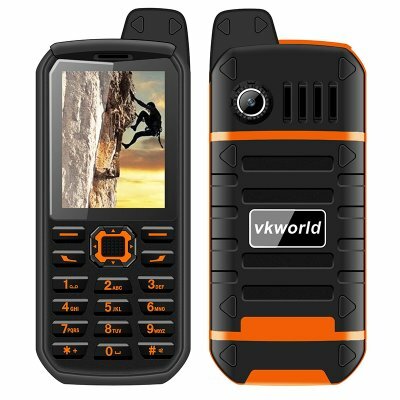 Successfully Added VK World Stone V3 Plus Cell Phone - Quad Band GSM, 4000mAh Battery, IP54, Camera, SD Card Slot, Bluetooth (Orange) to your Shopping Cart. A Phone that does exactly what you want and does it well, with its large capacity battery it is perfect for keeping in touch for days on end and comes with a large easy to use keypad. Get yourself a reliable companion for the outdoors that will follow you pn any adventure. Waterproof, dust tight and doubling as a power bank, it’s a simple compact bar phone from a famous manufacturer. The Stone V3 Plus from VKWolrd is a master of the KISS (Keep It Simple, Stupid) principle. Everyone longs for a phone that just works and now they can have it. no more distractions or interruptions, no breakdowns, failures or reliance on Wi-Fi or new fangled complications, this phone does exactly what a phone should do, and is quick and easy to use. For extra reliance the phone has a toughened shell and comes with an IP54 rating so while it isn't waterproof it won't mind being used in the rain and is sturdier than fragile large screen smartphones. Powered by a 4000mAh battery the phone boasts and incredible 72 hours of usage time and can keep ticking for up to 15 days on standby, so you can get a week or more worth or use from just one charge and don't have to worry about plugging it in each day. A modest processor is more than enough for this phones streamlined functions and with an micro SD card you can slot in up to 8GB of memory, perfect for storing pictures or your favorite music tracks as it can play mp3 files and has an FM radio so can keep you entertained on long journeys. The 2.4 inch display has a 240x320 resolution and makes reading text messages easy. With larger than average buttons the keypad ensures you can dial numbers and type easily so even numb or arthritic hands will find it easy to master. having quad band GSM network support means it can operate in nearly all countries and at just 140 grams and measuring a mere 14 by 5 CM this compact cell phone is a primary phone or affordable backup for holidays and trips away. The VKWorld Stone V3 Plus cell phone comes with a 12 months warranty, brought to you by the leader in electronic devices as well as wholesale GSM phones..
Arabic: - الهاتف المسنين الوعرة - Chinese Simplified: - 崎岖的老年人电话 - Czech: - Robustní starší telefon - Dutch: - Robuuste ouderen telefoon - French: - Téléphone âgée robuste - German: - Robuste ältere Handy - Hebrew: - טלפון קשישים מחוספס - Hindi: - बीहड़ बुजुर्ग फोन - Hungarian: - Strapabíró idős telefon - Italian: - Telefono anziano robusto - Japanese: - 頑丈な高齢者携帯電話 - Korean: - 견고한 노인 전화 - Malay: - Telefon warga tua yang lasak - Norwegian Bokmål: - Barsk eldre telefon - Romanian: - Accidentat de telefon în vârstă - Russian: - Прочный телефон пожилых - Spanish: - Teléfono mayor resistente - Thai: - โทรศัพท์ผู้สูงอายุที่แข็งแรงทนทาน - Turkish: - Engebeli yaşlı telefon - Vietnamese: - Điện thoại người già gồ ghề.